The actors, from left to right, Ichikawa Sadanji I in the role of Nangō Rikimaru (南郷力丸); Ichikawa Kuzō II* in the role of Tadanobu Rihei (忠信利平); Ichikawa Danjūrō IX in the role of Nippon Daemon (日本駄右衛門); Suketakaya Takasuke IV in the role of Akaboshi Jūzaburō (赤星十三) and Onoe Kikugoro V in the role of Benten-Kozō Kikunosuke (弁天小僧菊之助) in Aoto Zōshi Hana no Nishiki-e (青砥稿花紅彩画). The background writing is dialogue from the play. * The Tsubouchi Memorial Theatre Museum of Waseda University identifies this actor as <2> 市川　九蔵 which can be translated as Ichikawa Kuzō II. If the actor's name has been translated correctly, then the actor is likely Ichikawa Kuzō III (not II) as the actor using the stage name Ichikawa Kuzō II died in 1871, well before this print was made. The drama Aoto Zōshi Hana no Nishikie 青砥稿花紅彩画 by the playwright Kawatake Shinshichi II (1816-1893) is one of a number of kabuki plays based on the classic theme of "Gonin Otoko", a group of five dandy-thieves. The playwright replaced the original Ōsaka thieves Karigane Bunshichi, An no Heibei, Gokuin Sen'emon, Kaminari Shōkurō and Hotei Ichiemon with five Kamakura thieves named Nippon Daemon (modeled on the real thief Nippon Saemon, who was caught in February 1747 and executed in March), Benten Kozō Kikunosuke, Nangō Rikimaru, Tadanobu Rikei and Akaboshi Jūzaburō. The play is commonly called Shiranami gonin otoko (白浪五人男, Five men of the white waves) or Benten Kozō (弁天小僧), the play's main character. Ichikawa Sadanji I belonged to the triumvirat of stars who dominated the Kabuki world during the Meiji era (the two others were Ichikawa Danjūrō IX and Onoe Kikugorō V). He was the leading actor of many shinkabuki dramas and worked on scripts written by authors who did not belong to the Kabuki world, like Matsui Shôô, or adapted contemporary popular novels, like Kōda Rohan's "Hige Otoko". His two most successful roles were Marubashi Chūya and Baba Saburobei in "Keian Taiheiki" and "Ōsakazuki". Ichikawa Danjūrō IX belonged to the triumvirate of stars who dominated the Kabuki world during the Meiji era. (The two others were Onoe Kikugorō V and Ichikawa Sadanji I.) He spent lots of time and energy pioneering a new genre called katsureki but the Tokyo audience was more receptive to his amazing performances in the great roles of Kabuki like Ōboshi Yuranosuke ("Kanadehon Chūshingura"), Kumagai Jirô Naozane ("Kumagai Jin'ya"), Sukeroku ("Sukeroku Yukari no Edo Zakura") or Benkei ("Kanjinchō"). Suketakaya Takasuke IV was the worthy heir of his father Sawamura Sōjūrō V, excelling in wagotoshi, wajitsu or onnagata roles. He shared the stage with the Meiji giants Ichikawa Danjūrō IX and Onoe Kikugorō V. He posthumously received the name of Sawamura Sōjūrō VI. 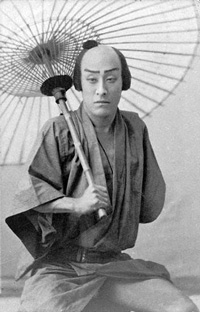 Onoe Kikugorō V's best roles: Benten Kozō Kikunosuke ("Shiranami Gonin Otoko"), Kataoka Naojirō ("Naozamurai"), Kamiyui Shinza ("Tsuyu Kosode Mukashi Hachijô"), Saitō Bettō Sanemori ("Sanemori Monogatari"), Satō Tadanobu/the fox Genkurō ("Yoshitsune Sembon Zakura"), Gosho no Gorozō ("Soga Moyō Tateshi no Goshozome"), Hayano Kampei ("Kanadehon Chūshingura"), Masaoka ("Meiboku Sendai Hagi"), Oiwa/Kohei/Yomoshichi ("Tōkaidō Yotsuya Kaidan").